The beauty we put in the architecture of our churches - not to mention the frescoes, vestments, etc. - should inspire our people in the holy virtues. Sadly, this doesn’t always occur. My wife’s paternal grandmother didn’t speak English.Yet she learned a point-blank phrase for the times no one else was at home and a knock at the door brought someone selling, promoting or even proselytizing. In broken dialect she would simply tell them, Me got my church, then smile and close the door. Granted, the cable guy was never on a mission to convert anybody, but had he ever tried anything she was ready! In all seriousness though, it’s not always a stranger knocking on the door who is luring us away from our church. Sometimes it can be our fellow parishioners. Or, there can be issues with the clergy, things we might dislike or disapprove of and decide to either not attend or go somewhere else. All in all, things can be said, feelings hurt and, what’s worse, grudges held. Yet, there is a full proof and simple solution to all of these and similar situations – an apology. For some that’s easier said than done but without it one wonders just how real our faith can be. Shouldn’t that be the main focus of our monthly church board meetings? Instead of reviewing how much money we have in the bank maybe checking how much peace and harmony there is among us would prove more profitable for all. Taking into consideration our problems, issues, each other. Or as the author of Hebrews writes “…let us consider one another in order to stir up love and good works, not forsaking the assembling of ourselves together, as is the manner of some, but exhorting one another….” (10: 24-25). I read an old architectural maxim recently: people build their buildings, then their buildings build people. 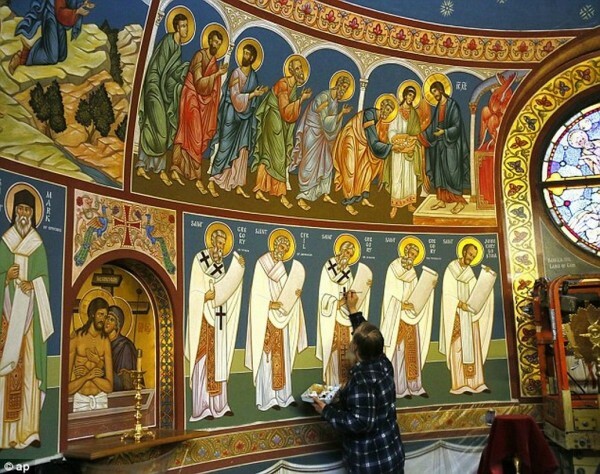 I would be so bold as to say that among Orthodox churches some of the most beautiful are Serbian. The beauty we put in the architecture of our churches – not to mention the frescoes, vestments, etc. – should inspire our people in the holy virtues. Sadly, this doesn’t always occur. There are cases within our parish communities where instead of being built up we’ve witnessed others being knocked down. Mean things are sad or done. Instead of fighting our passions, we give in to them and fight amongst ourselves. Among the Beatitudes our Lord says, “Blessed are those who hunger and thirst for righteousness, for they shall be filled” (Matt. 5:6). Interestingly, He doesn’t say ‘righteous’ but those who ‘hunger and thirst’ for righteousness. We’ve all heard the adage that the church is a hospital. It’s very true. It is in the church that we seek and find spiritual healing from a merciful, compassionate and forgiving God. One of the Bible’s shortest definitions for God is simply, “God is love.” But, I wonder, if we were created in God’s image are we not love as well? Apart from our seeking and expecting it from God, shouldn’t we also be compassionate, forgiving; shouldn’t we, also, be loving? In the parish community in which we seek out our salvation we are in the company of more than just fellow parishioners; other members in “good standing”. We are with our brothers and sisters with whom we are bound not merely through a common ethnic background, but one holy Chalice. In a society that attacks our Christian faith and morals the last thing we need is to be part of a community in which we attack one another. May we neither be the ones driving others away nor ever be tempted in abandoning our church. After all, in most cases it is the church of our fathers and mothers and grandparents; it is very much our home. After all has been said and done and injured feelings stir doubt within us, a bit of simple, folk wisdom should help us in our resolve – Me got my church!